The wedding ring, tradition dates back centuries and has always been used to signify the commitment between a man and a woman through marriage. The wedding band is traditionally worn on the left-hand ring finger most often in conjunction with the engagement ring. These two rings may be accompanied by other pre-engagement rings, all of which are designed to indicate the love and devotion the couple has for one another. There are certain variations to this fundamental tradition. For instance, some couples choose to have their names and proposed date of marriage engraved somewhere on the band. No matter what the specifics are of any individual marriage, it is certainly necessary to find the perfect wedding ring. Searching for the perfect wedding ring can be quite an exciting adventure albeit overwhelming. Each shopper has the same goal in mind: that is to find the perfect wedding ring. There are so many things to consider when looking for wedding rings. The first is the base metal. The options have expanded in recent years as jewelers are learning to work with other materials. Common metals used today include yellow gold, white gold, rose gold, platinum, silver and palladium, to simply name a few. Each metal comes with a general price point. Some rings are available in a multitone design in which two or more colors of metal are used to create a unique design. Another element that needs to be considered is whether or not a stone is to be included in the ring. In this case, elements such as cut, clarity, color and karat of the stone need to be taken into account, as well. Other design elements may include engraving or embellishment on the band itself or even the thickness of the band. 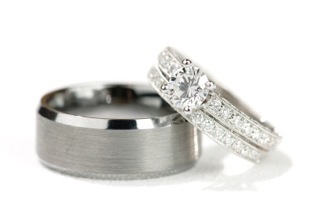 These are just to name a few fundamental design elements of a typical wedding ring. With so many items to keep in mind, it can certainly be a daunting task to sift through all the options. Even if, one has an idea in mind, finding the perfect ring that suits all of one’s criteria can prove to be quite a challenge. That is when opting for a custom ring design may be the best solution. There are a number of benefits for custom rings if one is willing to pay a slightly elevated price. It can be a fun and enjoyable experience if one chooses the right designer. In the end, one will certainly be satisfied with the results and will have a ring that will last a lifetime. Why Customize? Even, though, there seems to be an infinite number of ring designs available, the perfect one may not have been created yet. Customizing allows one to circumvent the painstaking process of combing through rings to find one that meets every demand. One can simply create from scratch the ideal ring, and have the opportunity to fine tune and customize every aspect of the ring to yield optimum results. It can also be a fun process for betrothed couples to undertake that adds a certain additional sense of sentiment to the ring. It is also a terrific way to ensure lasting satisfaction with the final product. Finding the Right Designer One of the most decisive factors when deciding to design a ring is searching for the right designer. Since this option is steadily gaining popularity, a number of commercial jewelers offer the option to customize jewelry based on a number of their existing templates. More specialized, custom jewelers may allow an, entirely, new design from scratch. They can cast a specific mold for the design. The type of designer depends on the degree of customization one desires. The most salient aspect is that the buyer and designer are compatible. It is essential that as a prospective ring purchaser, one feels comfortable working with the designer. The designer and buyer need to be on the same page, or the results will be unsatisfactory. It is best to meet with several designers with varying levels of specialty to find one that seems to best suit one’s needs. The process of designing a custom ring does come with its own set of challenges, of which finding the right designer is only the first. It is best that one knows what one is getting into before embarking on the journey from conception to completion. The easiest approach is to have a general idea of what the ring should look like before consulting with designers, but if one has no direction, the right designer can easily help find a course. The first step is to consult with your chosen designer. First figure out what options are available as far as customizing the ring. If the particular designer offers templates, investigate those to gather inspiration, or if a particular design seems desirable start there. Certainly first gather all the information as to what is available to evaluate before proceeding. Once one has all the options, begin identifying what characteristics are most appealing. These should be chosen down to the truly last detail. Later on the designer will help decide which choices are feasible when creating the ring. Start piecing together potential ring designs. Do not stay restricted to just one design. Put together several ideas that can be discussed with the designer to eventually create the ideal ring. Also, start to think about what metals or stones one would like to include in the ring. Sometimes, the type of metal can place certain restrictions on the design, so try not to be too specific yet in choosing the different elements. At this stage, it is best to still leave some room for flexibility. After this phase, it is time again to meet with the designer. At this point, the designer will help to narrow down which designs are feasible, which need to be altered, and which simply cannot work. The goal at this point is to start to narrow it down to the perfect ring and determine all the specifications as one would like them to be in the final product. This final design will then be made into a wax carving to be viewed at a later time. This wax carving will offer a more concrete view of what the final ring will look like. If it does not appear to be quite right, this is the point to reconvene with the designer to discuss other options or alterations. Once the wax model of the ring is satisfactory, the process of creating the ring can move forward. The final leg of the process is casting and setting the ring. At this point, the mold will be shaped and the metal of choice is poured to create the ring. Then one can choose exactly which stones will be set into the ring if desired. Once these are in place the ring is essentially finished. Any last-minute details such as finish or engraving can be added at this time. It is always necessary to be sure that the design is perfect and is as agreed. If there are any discrepancies be sure to bring this up with the designer as soon as possible. Most jewelers have a policy on custom jewelry that states that they will fix any flaws in the fabrication. These are other items to be sorted out with the designer during the initial consultation phase. Otherwise, if the ring is satisfactory, the process is complete. The best place to begin looking is in local jewelry stores. Enquire as to what services are offered and their policies on custom jewelry. Otherwise, the Internet has made it tremendously easier to find custom jewelry makers. Oftentimes, these designers will work over the Internet to help create the perfect wedding ring. Of course, a custom ring can often times be more expensive than a prefabricated ring. This price is highly subjective and depends on a number of factors including, metal of choice, metal quality, size, stone, stone quality and complexity of design. The cost of these services can also vary from jeweler to jeweler. However, if one desires a custom ring the best starting budget should be around $500. Keep in mind that the cost can potentially exceed thousands of dollars so discuss pricing with the jeweler beforehand. The greatest advantage of choosing a custom jeweler to create a wedding ring is that, in the end, one is guaranteed to have the perfect ring. It is also a unique creation that will be one of a kind and symbolic of love and experiences the couple has had together. A wedding ring is an incredibly sentimental and symbolic memento. Customizing the ring will only augment this exceptional value and deep meaning that the ring represents. There should be a terrific deal of care and research dedicated to selecting the right designer and then creating the right ring. Though the process may have its challenges, the results are far beyond rewarding.